The solution for partials has been given by Randy Parker. The solution for HAML options has been given by Jason Tennier. And as a newbie to StaticMatic, I do wonder how well the gem is being maintained now. Both of these patches have been around for a while, yet they haven’t made it into the distribution, and I wonder why? Check out my new blog, Nerdabout New York. Launching November 15. For some reason someone thought I knew something about nerds, and it led, very rapidly to this. I’ve got some suggestions as to which usenet news groups and mailing lists (or listservs) are worth following with regard to keeping up-to-date on what’s happening in Client-Side (or Presentation Layer or Front-End) Web development. One of the things I was doing while working for the College Board was researching strategies for accessible Web content. So it became apparent that Pragmatic Progressive Enhancement, or what we used to call Graceful Degradation, was in fact the best architectural strategy for ensuring an accessible and robust user experience. I just got finished writing a new version of the del.cio.us whuffie bookmarklet. It’s a bookmarklet that adds via: tags to your bookmarks for attribution purposes, so you can have a little extra meta-data about where your links are coming from. Lately I have been fielding a lot of questions at work about strategies for assuring that the markup is semantic, accessible and valid. I recently compiled a short list of Firefox extensions that test whether XHTML is standards-compliant. Oops! I accidentally hit the Back button and canceled my attack! In all serious, the CSRF attack toolkit put together by Danny and his colleagues was impressively unsettling. 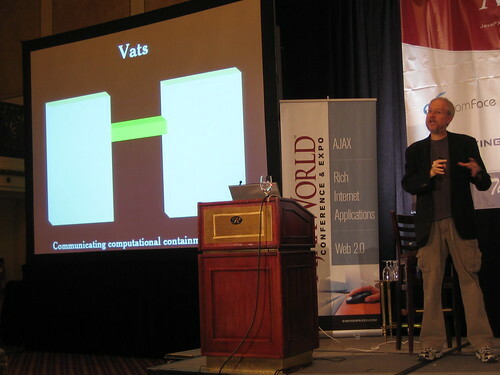 Vats: Communicating Computational Containment, originally uploaded by Noah Sussman. 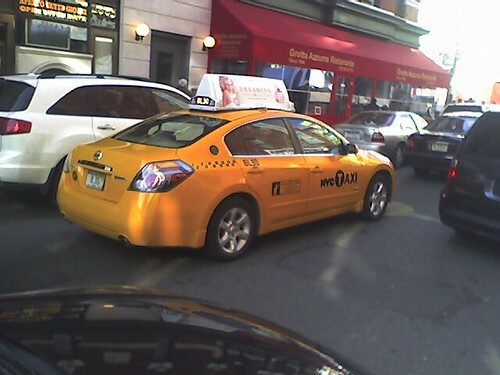 Hybrid cab, originally uploaded by Noah Sussman. This is the first hybrid cab I have seen in the city. I think it was a Nissan but I’m bad with make-and-models.